25-Oct-2003 -- This is the second of a two-confluence hunt conducted on October 25. Arriving in Yangpingguan after my 11-kilometer hike from 33N 106E, I return to the train station with the hopes that there will be a train going to Hanzhong soon. No such luck. The next train is in the evening, so I have to go by bus. As I leave the train station, a bus arrives with a Hanzhong placard. I am in luck. The driver stops for breakfast and I tell I want to go to Hanzhong. The driver tells me we should arrive in Hanzhong about 3:30 PM, but the road is bad and there could be delays. The ticket seller ushers me to the best seat in the bus, riding shotgun. This seat is a deluxe model with an extension for the legs. Receiving special treatment like this in these out-of-the-way places is common, and I eagerly occupy the seat while everyone else goes to eat lunch. Getting this seat is worth missing lunch. On the trip, I share the front part of the seat with a young boy about 7 who, like me, also likes to be up front. Along the way, I realize with a start that I had cycled this road on a trip from Chengdu to Xi'an in 1999. Not much has changed. The road is indeed bad and full of caravans of huge cargo trucks heading west. We are stopped for about 30 minutes while a crane loads a road paving machine on a truck. The roadside is lined with restaurants advertising Sichuan food. 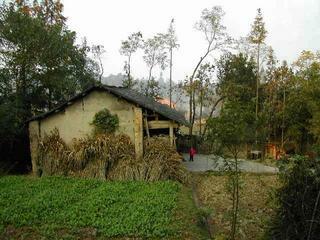 Given the lack of Shaanxi restaurants their food must not be too appealing. The driver is one of the continual honkers and the horn seems to be pointed inside the bus making it a deafening experience. He must be a native of Hanzhong, which has the worst case of honkitis I have experienced in China. It was memorable in 1999 and is just as bad now. Once arriving in Hanzhong, the transport to the CP is very smooth. I need to get about 10 km south of the city and a minibus going in my direction is leaving from the bus station as I arrive. The driver, however, is intent on trolling until the already full bus is packed. We stop along the way to pick up more passengers with two 50-liter jugs, 25 sheets of glass, and a good number of steel pipes and rebar. As the bus heads south I watch the GPS pointer swing to the right. As we entered a village, I spot a side road in the direction of the CP that looks promising. I ride the bus to the end of the village and spot another road in the same direction. At this point I am 1.75 km away and need to decide which road to take. A waiting mini-van makes the choice easy and I jump aboard one full of high school boys returning home after school. They were excited to see me, but at the same time full of self-conscious shyness. A few got up the courage to ask a few questions in English. At about 250 meters from the CP the GPS pointer turns right angles to the road and I get off and start walking up a small footpath. It is now around 5 PM and the villagers were all out working the fields. This is a densely populated area with low hills. Finding the CP is a piece of cake. It lies in the side yard of a mud and straw house between plots of crops. Nearby the farmers are burning the dried straw left over from a recent harvest and will spread the ashes as fertilizer for the next crop. Returning to the city of Hanzhong, I go to the train station and got a "no seat" ticket to Chengdu due to depart at 8:49 PM. This gives me time to have a well-earned meal, my first since breakfast 12 hours earlier, and check my email at the nearby internet bar. On the train, I am able to upgrade to hard sleeper without any trouble. While walking back to my berth, I come across Sebastian, a German university student studying Chinese in Qingdao for a year. He is with a group of seven Chinese businessmen heading to Chongqing. This entailed a 40-hour train ride and a 5-hour bus ride to attend a two-day motorcycle conference. Sebastian was recruited to be the "white face" for the company just for this event getting free trip and a small payment for his time. When he sees me, he is overjoyed to see another Westerner on the train and begged me to sit and talk with him for a while. The train has mini-VCD players for rent and his group is watching a war movie. We had a little chat before I went back to claim my berth. I arrive back in Chengdu at 6 AM, 30 hours and two successful confluences later. This confluence was christened the Smoky Confluence.